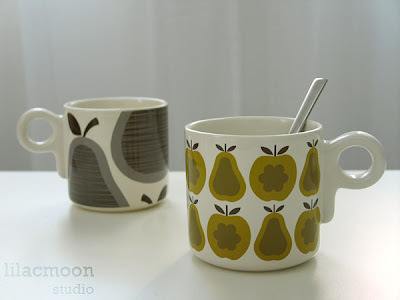 Like many of you out there, I like Orla Kiely.. I'm not like her biggest fan or anything but I was super excited when I heard about her Target collection. Cute pattern designs on affordable goods? Why not. So few days ago, I went to Target in San Bruno (the only location near me that is easily accessible by public transportation) and checked out some of her stuff. They had plenty of cups and plates but not much else. Many of the shelves were already empty :( I did pick up the last of the 2-tier serving trays and some mugs and tumblers. Mugs are a lot bigger than I expected; it's like a small soup bowl to me. And the 2-tier tray is kinda overpriced at $19.99, considering that the plates that make up this 2-tier are less than $4 individually. But I got it anyway because it's cute and I needed one. I was going to shop online when they officially launch but I'm glad I checked them out in person because some of the items I had my eyes on were actually not as cute as I expected. Like the mugs with floral patterns in blue and orange.. Didn't think they were as cute as the green pear ones in person. Plus many of them had the patterns not quite aligned.. Some tumblers had this problem, too. I must have stood there for a good half hour inspecting all of them to pick out the best ones. I've been drinking green tea in the pear mug all day today, and I love it. It definitely brightens my mood, so I think it was worth the trip. Retail therapy, baby. I might still consider the apron and the white serving tray when they become available online.. Oh, and the coasters and the canisters.. 0_o Oh, help.